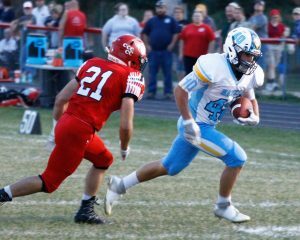 The Lynnville-Sully Hawk football boys flexed their muscles in their 74-0 win over the Cardinal, Eldon Comets last Friday. The Hawk offense is usually very balanced between their rushing and passing attack. However, on Friday, it was all about running the football, and that’s exactly what the Hawks did. Three players had over 80 yards rushing, and nine out of the 11 touchdowns scored were from a running back. The Hawks ran for 369 rush yards in all, most of which came in the first half. Senior Jesse Van Wyk blocks for junior Nate Stock in the game at Cardinal. Stock had 83 rushing yards on Friday. The leading rusher for L-S was senior running back Sage Zylstra. Zylstra had a total of 124 rushing yards on just seven carries. Out of those seven carries, three of them were for touchdowns. Junior running back Nate Stock was also a big factor in the Hawk rushing attack. Stock only had two carries, but he had 83 yards total rushing, which averages 41.5 yards per carry. Stock also had one touchdown. “Early in the game, we found good rhythm on defense and were able to get stops. We got to the ball fast and made a lot of tackles,” Stock said. Junior Gage Vander Leest had five carries for 88 yards. Three of those carries were touchdowns. Junior Evan Squires also had 27 yards rushing and two touchdowns. Senior quarterback Elijah Collins went 3-5 on the night with one touchdown and a total of 78 yards. Sophomore Kinnick McFarland also had one passing touchdown to freshman Kodie Waggoner. Cheerleader Kennedy Roland pumps up the crowd with a handstand at Friday’s game in Eldon. 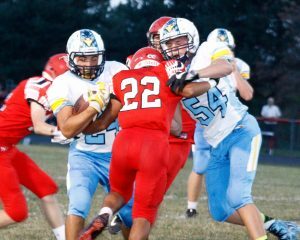 Sage Zylstra carries the ball in Friday’s 74-0 shutout of Cardinal where the senior ran for 124 rushing yards and three touchdowns. Once again, the Hawk defense performed very well Friday night, shutting out the Cardinal offense. The Hawk defense held the Comets to only 54 total yards, rushing and passing. Stock was the leading tackler for the Hawks on Friday night with a total of six tackles. Zylstra, Vander Leest, and senior Kemper Lukehart all had five tackles. Senior Jesse Van Wyk and sophomore Zane Fraker each had a sack. The Hawks had two interceptions, one com-ing from Stock and another from senior defensive back Carson Dunsbergen. L-S started off strong against the Comets by scoring first on a 10-yard touchdown run from Zylstra. The Hawks kept rolling in the first quarter, scoring five touchdowns by the end of the quarter. L-S continued to dominate, scoring another five touchdowns in the second quarter. The Hawks never punted the ball in the first half. At halftime, the score was 68-0 in favor of L-S. The Hawks scored one more touchdown in the fourth quarter to make the score 74-0. The Hawks (4-0) will travel to Winfield next week to take on the Winfield-Mt. Union Wolves. The Wolves have a record of 0-4 and previously lost to Cardinal, Eldon 14-6 in week three.